"Combining feta cheese, balsamic vinegar, and fresh basil is a winning recipe for some delicious deviled eggs! Enjoy!" If you have any leftover yolk mixture, save it and make an egg sandwich with it later, or cut open an avocado and place the egg mixture in the spot where the seed is and enjoy! I am a deviled egg freak and these are a new favorite. Tasted great, but the egg yoke mixture was a little less thick than I would have liked. I may try again and leave out the tomato. These were delicious!! 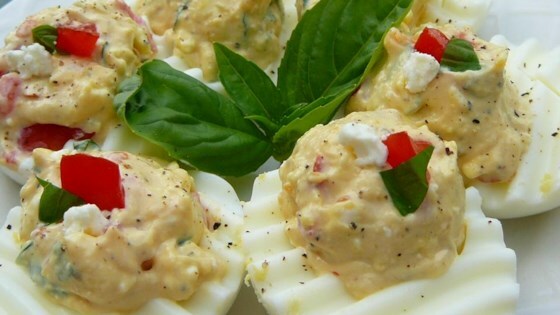 Because of the basil and tomato, I'd say they are more like Italian deviled eggs rather than Greek. I plan to make these again for summer family get-togethers.